Bold Type Books, 9781560259329, 416pp. The United States is currently embroiled in a national debate over the growing public health crisis caused by poor diet. People are starting to ask who is to blame and how can we fix the problem, especially among children. Major food companies are responding with a massive public relations campaign. These companies, including McDonald's, Coca-Cola, Kraft, and General Mills, are increasingly on the defensive. In response, they pretend to sell healthier food and otherwise position themselves as "part of the solution." Yet they continue to lobby against commonsense nutrition policies. Appetite for Profit exposes this hypocrisy and explains how to fight back by offering reliable resources. Readers will learn how to spot the PR and how to organize to improve food in schools and elsewhere. 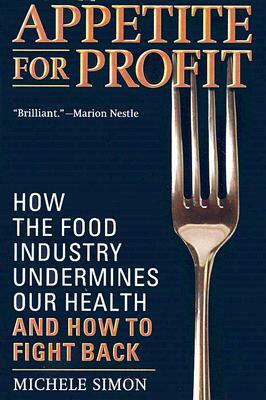 For the first time, author Michele Simon explains why we cannot trust food corporations to "do the right thing." She describes the local battles of going up against the powerful food lobbies and offers a comprehensive guide to the public relations, front groups, and lobbying tactics that food companies employ to trick the American public. Simon also provides an entertaining glossary that explains corporate rhetoric, including phrases like "better-for-you foods" and "frivolous lawsuit." Michele Simon is a public health lawyer who has been working as a nutrition advocate since 1996, specializing in policy analysis and legal strategies. She is the founder of the Center for Informed Food Choices and edits their newsletter, Informed Eating. She has published numerous articles about such issues as the National School Lunch Program, organic standards, the USDA's dietary guidelines, veggie libel laws, genetically engineered foods, and banning obesity lawsuits. She lectures extensively, has appeared on numerous radio programs, and teaches Health Policy at the University of California, Hastings College of the Law, where she also received her law degree. Michele obtained her master's degree in public health from Yale University.